DROPPING A PLANT DOWN IN A POT. 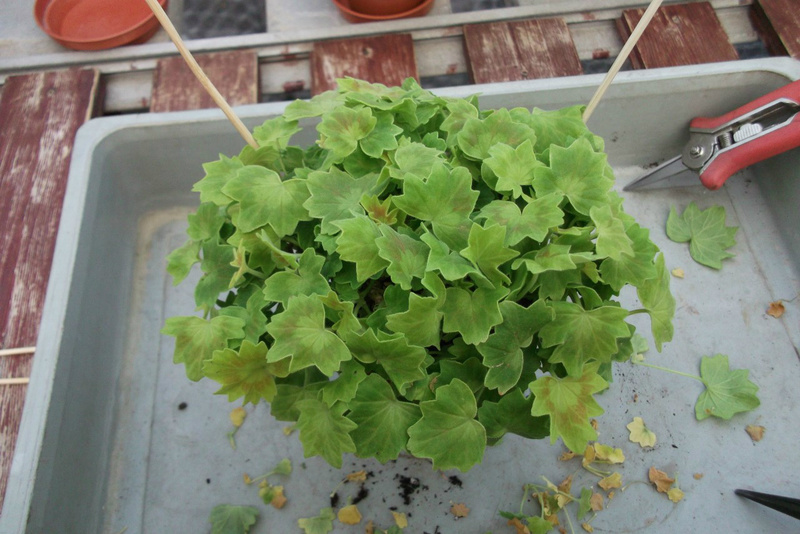 In the photo you can see a 2.5 year old plant of Sarah Don, which is showing old wood. As it is getting TOO big for a 5", I want to pot it on into a 6" pot for next year, this is what I did. I took the plant out of 5" and took about an inch of soil from the bottom, I use a kitchen fork with tines bent over for this. Then I potted it on into a 6" and only put a little compost in bottom of pot, the result you can see in the photo. It drops the plant down and hides the old wood. As the plant was stopped 3 weeks ago, I am hoping the new growth will come down the sides as well. 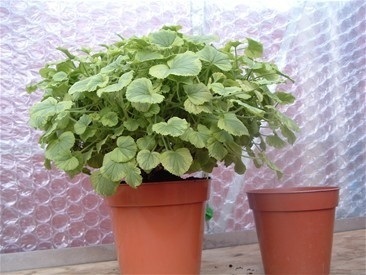 I never stop a plant and pot it on at the same time, as it is too much of a shock for it. 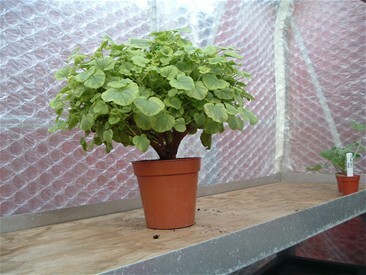 I find it best to leave a few weeks in between, as in my mind it must reduce the stress on the plant. 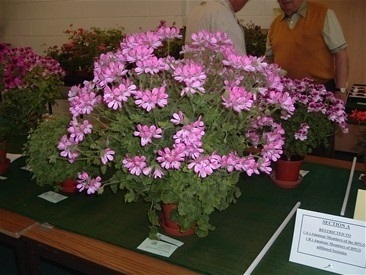 Just to prove it works here is the same plant, after its last stop on the 9th march 2009 for a show. While I was cleaning this plant of Scottow Sparkler below, I used canes to help keep the shape. Well, actually for this I use wooden barbecue skewers that are cheaper and I find last longer than the green canes. As you can see I cut the canes back so they are not seen which looks much neater. 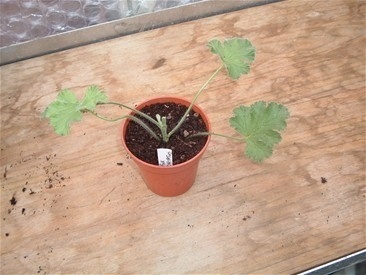 This cutting was taken in early September, soon as it was rooted the growing tip was removed. 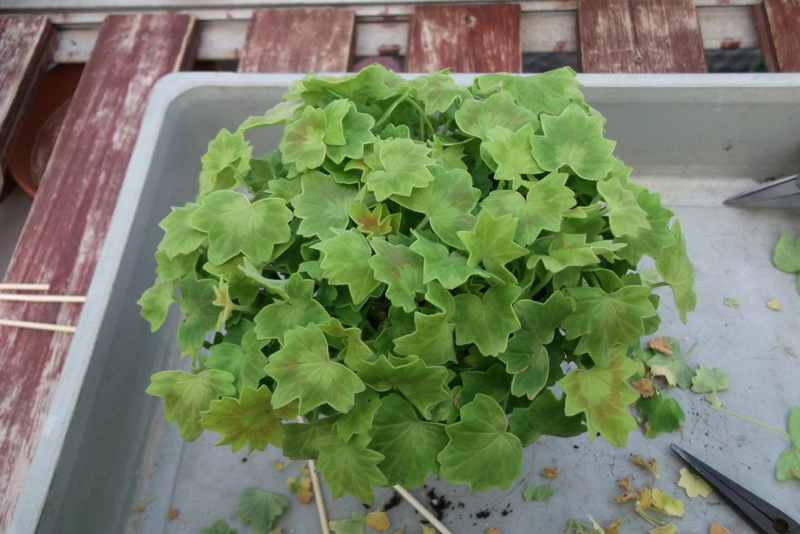 A few weeks later it was potted on into a 3" pot, note that 2 leaf nodes were buried under the soil level. Providing no leaves are buried that will be OK, it will break and grow from below, giving a nice compact start to the plant. 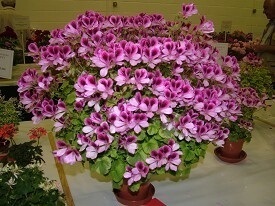 This plant was 21 months old when shown at BPGS Show 2008, it started of life like the ones above. 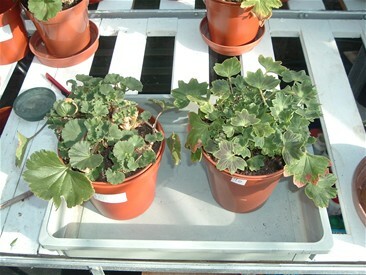 Below is the same plant which was cut back hard a few days after the show, the cutting above was taken from it after it came back into growth. It has since had 2 stops, the most recent was 2 weeks before Xmas 2008. 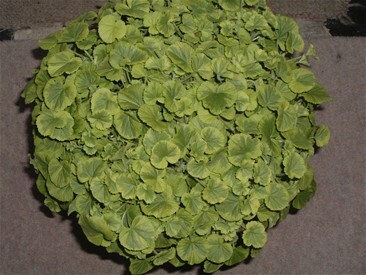 To give you an idea of the size of the plant the carpet is 28" wide. It is now 27 months and the picture shows it after the latest stop, it has another 6 months before PAGS National 2009. The last stop will be made 12 weeks before the show, and most growing tips will be stopped at 3 sets of leaves. 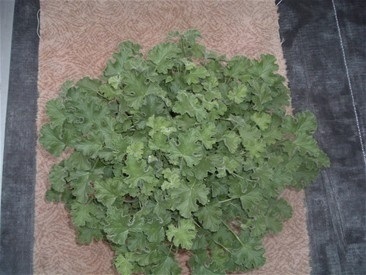 All growing tips, even the ones with 1 or 2 sets of leaves will have the growing tip removed. I have found that if it is not done this way, they will come into flower too soon and leave a gap. THE SAME PLANT CUT BACK AFTER SHOW. Below you will see 2 plants that were cut back after a show, they have started to come back into life with the emergence of new growth. Unlike the advice given in a lot of books, I DO NOT strip all the leaves off. Any that are left after I have cut all the stems back remain on the plant, as I find they help to bring that plant back into life quicker. 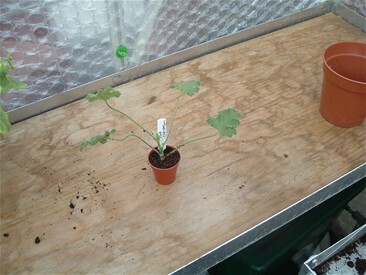 The photo helps by showing older bigger leaves, these will be removed once the growth is well away. Make sure that all stems are cut back above a node, if not you could find that the stems will die back.